On a typical Tuesday morning, Seth DeLisle, mechanical and aerospace engineering graduate student in the College of Engineering and Computer Science, is working on complex differential equations that measure the lift and thrust a helicopter needs to fly. Seth DeLisle faces off against an opposing lacross player. 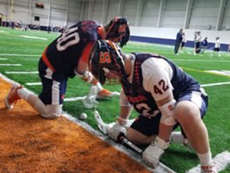 Even when his classes are over for the day, DeLisle is still working on engineering fundamentals as a faceoff specialist for Syracuse’s men’s lacrosse team. “Power and leverage is a big part of it, speed and velocity,“ says DeLisle. Faceoffs are one of the most important aspects of lacrosse. They occur at the start of the game and after every goal. For a team to score, they need possession of the ball. To get possession of the ball, you need to win faceoffs. With two players just millimeters apart at the center of the field, engineering science can provide an edge. DeLisle is passionate about both engineering and lacrosse and he does not have time for much else during the spring semester. “Some days I’m up at like 5:30 for an early morning lift and then I got practice, classes get back after midnight, one o’clock, two o’clock in the morning because you have to study and get all your work done. It definitely is tiring but it’s worth it for sure,” says DeLisle. For DeLisle, studying engineering at a tier one research university while also having the opportunity to play major conference D-1 lacrosse is a dream come true.